This year’s Pitti Immagine Uomo has been taking place in Florence from June 12th till June 15th, where the world’s most stylish men have been gathering to discover the new season’s menswear designs and trends. Both fashion and accessories are given pride of place at the event, which was attended by numerous VIP guests, including Apple’s CEO, Tim Cook; the Italian soccer player, Marco Borriello; British fashion designer, Craig Green; Italian MotoGP rider, Andrea Iannone, and many more. One brand championing the craftsmanship and precision of Italian design is GuidoMaggi, highlighting the importance and traditions of shoemaking in Italy. And the GuidoMaggi elevator shoes were stylishly worn at the Pitti Immagine Uomo 94. One man who chose to elevate his style with GuidoMaggi was Gianluca Casamento, the director of Zhor Perfumes of Milan-Brera (not far from GuidoMaggi’s Milan showroom in Via Fiori Chiari). 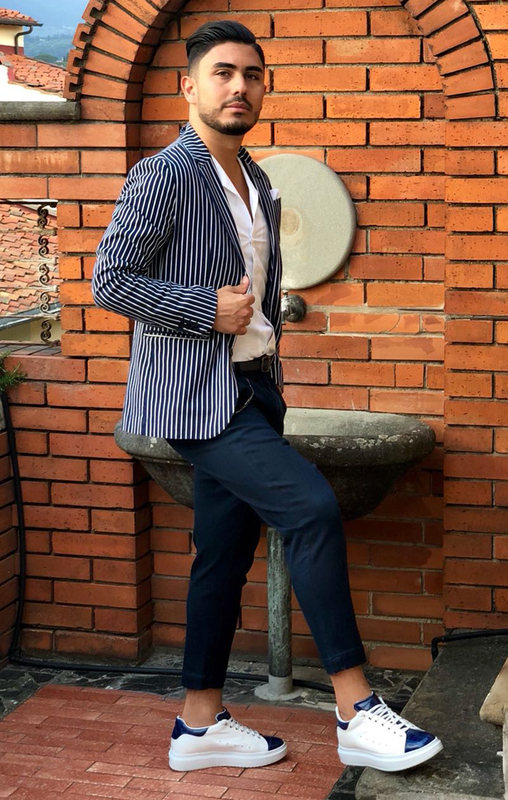 He opted for a modern casual look with a white Korean collared shirt, lightweight blue pants, brought together with a blue and white striped jacket. 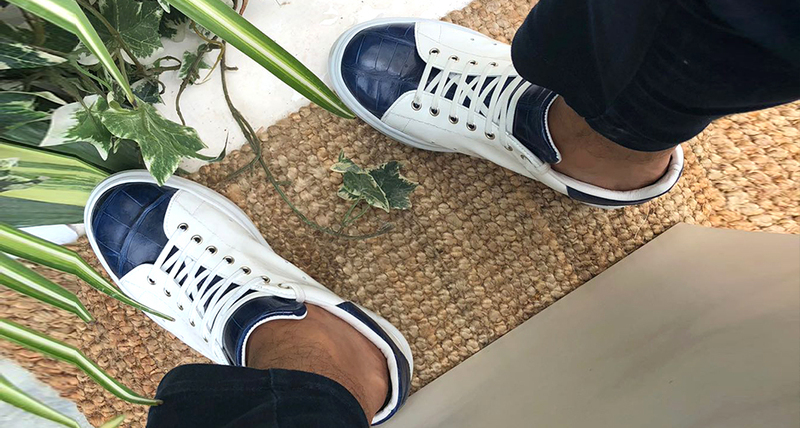 His outfit was topped off with a pair of fresh elevator sneakers, featuring white patent leather and blue crocodile leather accents – giving him an appearance that’s perfect for a hot June day. These stylish elevator sneakers also discreetly and instantly increase his height by 2.6 inches, as well as showcasing the luxury leathers and Italian handcrafted designs of Italian shoemaker, GuidoMaggi. At the Pitti Immagine Uomo, luxury tailoring and fine fabrics were on display, highlighting Italy’s world renowned history of fashion and design. It’s the ideal event for showcasing the comfortable, elegant and on trend designs from the world of GuidoMaggi. With the ability to increase height without compromising on style and comfort, GuidoMaggi is able to deliver luxury elevator shoes using a range of the finest leathers, materials and technology, all handcrafted in Italy using traditional shoemaking techniques to ensure a product of the highest quality. The showcasing of Italian fashion doesn’t end after the Pitti Immagine, however GuidoMaggi and the world will then be turning their attentions to one of the world’s most famous fashion events; Men’s Fashion Week 2018 in Milan, which is due to begin next week with a focus on the Spring Summer 2019 collections. And GuidoMaggi will be there to elevate trend with luxury height increasing shoes for men.